Summer teaching is in full swing, so progress on both the knitting and reading fronts has been slow. My Fade is coming along, though, and what a fun knit! The pattern is easy, but you’ve always got the next color shift to anticipate, so it doesn’t get boring. I’m just about halfway through. As for reading, I am inching toward the end of Les Misérables but will save talking about that for another post. 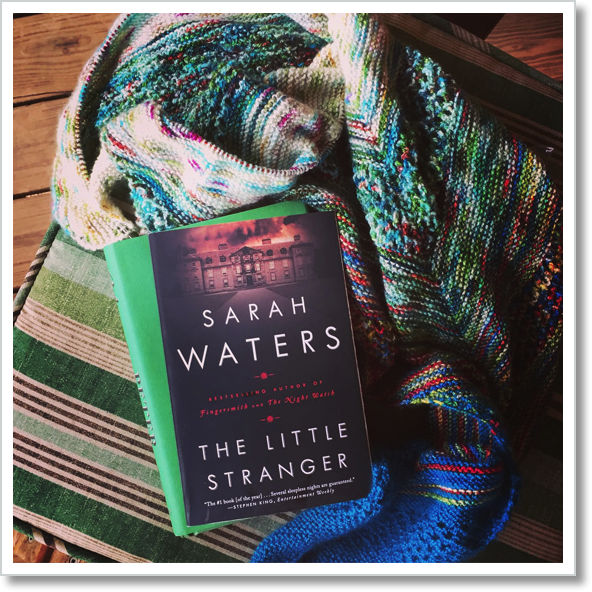 Two books that I finished before summer school started but didn’t manage to tell you about are The Little Stranger, by Sarah Waters, and Celine, by Peter Heller. Peter Heller’s The Painter is one of my all-time favorite novels, so I read anything he writes. Celine is entertaining, but it’s no The Painter. I liked the characters and found the story compelling, but it was like watching an episode of Law and Order and trying to compare it to The Godfather. The two books are worlds apart. I’m glad I read Celine, but it’s not going to hang around in my brain. As for The Little Stranger, I loved the “The House of Usher” vibe, and the story held my attention all the way through, but the ending . . . meh. I don’t want to give anything away, so I won’t go into detail. I’ll just say that with a stronger finish it could have been exceptional. As with Celine, I’m not sorry I read it, but I was hoping for more. That’s it for me today. I’m off to grade papers. Check out Unraveled Wednesday over at As Kat Knits to see what other people are knitting and reading this week. Be well, my friends. I had the huge pleasure of celebrating World Wide Knit in Public Day yesterday with my BFFF, Cari. If you’re new to the blog and don’t know Cari, I write about her all the time. I wrote more than usual here and here. She’s amazing. Believe it or not, we met in person for the very first time on WWKIP Day 2013, by accident! We’d gotten to know each other a little through Cari’s blog and through conversations on Ravelry when I lived in Chicago, but we’d never actually met in the flesh. Paul and I had just moved to Tennessee and were having lunch out, and this person walked up to our table, looked me dead in the eye, and said, “You’re knitting. You must be Melinda.” Instant friendship. Paul even snapped a picture! I was working on my Glacier Sweep shawl. After that crazy chance encounter, Cari and I have made a point of being together on (or near) every WWKIP Day since. I can’t begin to say how much happiness this brings me. It’s hard to imagine WWKIP Day before Cari, but I was looking back at some old pics and remembered that there was at least one fun one in Chicago. 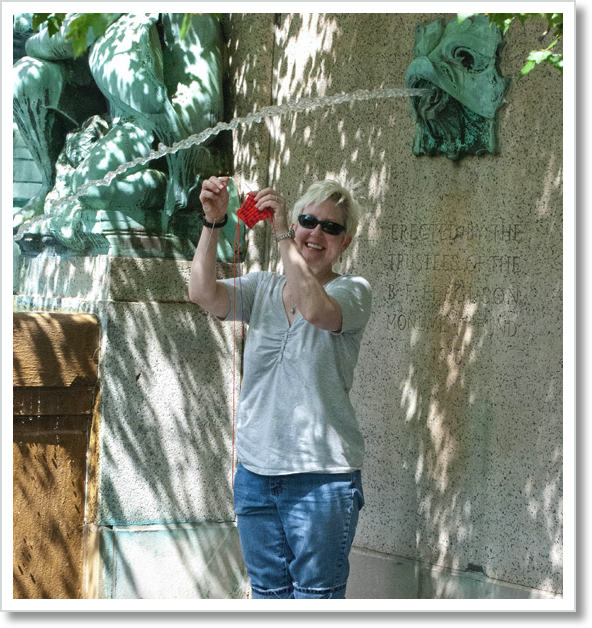 In 2012 I was in a Ravelry group that had a WWKIP Day scavenger hunt. The idea was to take a picture of your WIP in all sorts of crazy situations. You got points for each picture, and the person with the most points won. Here are a few mine. The sock held by a child under 9 (1 point). These guys are practically grown up now! The sock at a height of at least 50 feet (3 points). Paul was an exceptionally good sport during all of this. The sock with a family of non-knitters who didn’t speak my language (3 points) and who volunteered their son to hold the sock. We’re also standing in front of The Bean, another internationally recognized landmark (5 points). Plus, that’s a hand knit hat I’m wearing. I can’t remember how many points the hat was, but it should have been a lot. It was 98 degrees that day! The best part about doing this was meeting so many nice people. I was amazed by how willing everyone was to participate and by all the great conversations the picture taking spurred about knitting and all kinds of other things. I didn’t win the competition that year, but that turned out to be completely beside the point. By the time I finished taking the pictures, I’d already won the day. Here’s hoping that you are enjoying knitting in public somewhere fun this weekend! Be well, my friends. And knit on! !